February is the month of love…so they say (whoever “they” are, lol). When you have been married a long time….sometimes “love” is put on the back burner for things like…raising kids, paying the mortgage or just getting a decent's night sleep! I am in that phase myself right now, but I also know how important it is to reconnect with your spouse during this hectic phase of life! Let's be real here….the crazy, kid-raising, hectic period of our marriage….is also the period that so many couples DON'T MAKE IT THROUGH! I don't want to be one of those statistics. I want to try and reconnect with my spouse regularly even during the chaos of our life! It is easier said then done…so I came up with some easy ideas of how to reconnect with your spouse! I hope you will take the time to implement some of these ideas! I think it will make a huge difference in your relationship. Be open to unusual date ideas….it doesn't have to fit into the “date” box to work as TIME TOGETHER! Find something…anything that you enjoy doing together. This doesn't have to be in the category of extreme sports! Honestly…my husband and I are pretty boring…we love going to the movies. It is a typical, common date…but it is what we enjoy! We have certain shows we love to watch on TV…again…boring I know! 🙂 Nevertheless, we look forward to new episodes and have fun connecting in these simple ways. We also enjoy going on walks and playing tennis when the weather is nice. Finding a few things you and your spouse can do together is imperative to growing your relationship. We have had times in our marriage that we were like ships passing in the night…we rarely saw each other and were exhausted all the time. Luckily, for us we aren't dealing with that right now….but we still stay too busy. Sometimes you just need to walk up to your husband and HUG HIM. A long hug can really help your worries flow away and can help you reconnect with your spouse. A quick back rub or neck massage can go a long way in rekindling love and romance. Is reconnecting with your spouse a priority for you? I think it should be….and if it isn't…you can make it a priority! Marriages slip away so easily it seems, but if more couples made their marriage a priority…I think there would be a decline in divorce rates! Just like your child's health is a priority to you….your marital health should also be a priority to you and your spouse! My husband and I try to touch base every day during our work days. It is usually a brief call (I don't like to talk on the phone 🙂 ), but we just tie in and see how the other's day is going. I know that not all job situations allow for touching base….but if your situation does…then do it! If my husband is swamped with meetings and a phone call is out of the question….he will send me a quick text. Knowing that I cross his mind during the day is comforting to me and makes me feel loved! Touching base with your spouse is an easy way to reconnect! 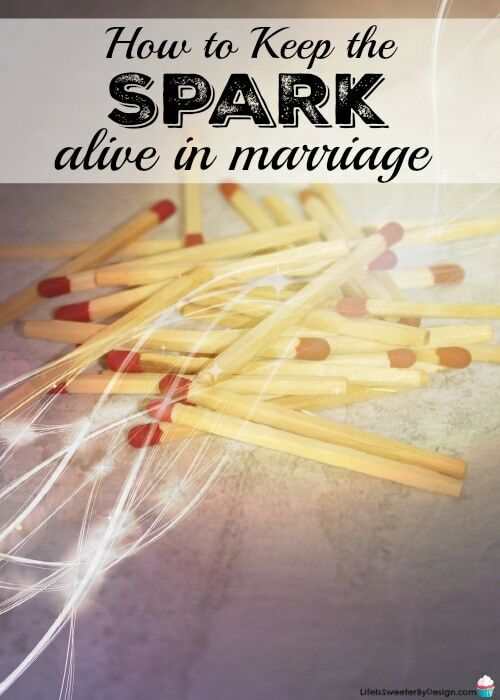 I have read a lot of books on marriage over the years and several have been VERY helpful and have actually made a difference in my marriage. I don't spend all my time reading books on marriage….but I try to read one or two a year to keep the topic on my mind during the year! Love and Respect by Dr. Emerson Eggerichs is a MUST READ! The 5 Love Languages by Dr. Gary Chapman is a book that has information that spans the decades and can change your whole marriage! Sacred Marriage by Gary Thomas is a book that really opens your eyes to new ideas surrounding marriage and God's will for your life! 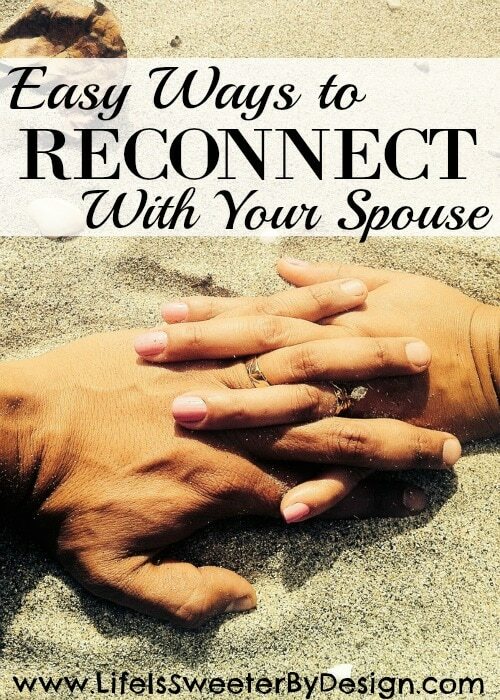 I hope these simple and easy tips to help you reconnect with your spouse are helpful! I know how hard marriage can be…especially if you have children! I also know how important keeping your marriage strong is for you, your spouse and your children! What are your favorite ways to reconnect with your spouse? You can check out some romance ideas that would work any time of year and also how to keep the SPARK alive in your marriage!